How Can You Be So Kind to People and So Unkind to Your Dog? It saddens me. So much. We see people who are perfectly polite to their fellow humans, who hold doors open and help people with their coats; people who say please and thank you, who don’t interrupt others; who laugh politely at lame jokes and encourage small children. Give them a dog’s leash to hold and you may see another side of them. They half-throttle their puppy, they’re holding the leash so tight. They yank and jab the leash when the pup is sitting perfectly still. They decide to move so they haul her along behind them. They bark rapid-fire commands at the dog: “Sit. Sit! I said SIT! Off! Down! Siddown!” and when the confused dog sits they say nothing. Where have all the pleases and thankyous gone? I think a lot of this boorish behavior comes from a lack of confidence. Somewhere along the line, they’ve seen or heard something about having to show your dog who’s boss. If the dog moves a quarter-inch to the left or the right it must be pushed and pulled (punished, in simple English) to make sure it knows its place. Their puppy is some kind of alien who must be continually stamped on to prevent it taking over the universe. Or perhaps just to stop their dog getting a toehold in their heart? There’s huge social pressure for your dog to “behave nicely”. And there is an equally huge social pressure in appearing to be in control when the pup misbehaves. To be seen to be doing something masterful. To be the “leader”. And nowhere is this pressure stronger than in the case of the Growly Dog. You need only remember that your Growly Dog is not kicking up a fuss because he’s stubborn, or obstinate, or nasty, or aggressive. He’s trying to keep away from something he fears. And there are some very simple quick fixes you can put in place to start to change things straight away, and - suddenly appear to be the socially acceptable owner with the socially acceptable dog! Click here to register for your Free Live Training right now and begin the change! There’s a lot of mediaeval claptrap talked about how to treat dogs. And sadly people who really should know better, listen to it. It has been proven scientifically over the last eighty-odd years, without any shadow of doubt or question, that the way to get the fastest and most durable results from any animal, humans included, is to work through positive reinforcement. Simply put - reward what you like. Killer whales will happily put their chin on the edge of the pool and hold their mouth open to have their teeth brushed; rhinos will place their hip against the bars of their cage so that a vet can draw blood safely from outside; chickens will perform elaborate “agility-style” routines or act as wartime spotters in aircraft. All for an appropriate reward - a fish or a smidgin of grain. These dogs are not different, specially-abled dogs - they’re just dogs - often rejected, rescue, dogs. They’re the same as your dog. Your dog can do so much more than you may imagine! Where’s the Integrity in this? So these people who are kind to their family and harsh on their dogs are acting out of character. This chasm between the two extremes must cause conflict within. But there’s an easy way to resolve it. Give your dog the same respect and understanding you extend to your family and friends. Your dog has a brain too! And she has feelings! Work with her instead of seeing her as something to be opposed and contained. That doesn’t mean you put up with poor behaviour. You need to teach your pup what you want, and reward her when she makes the right choices. If you involve your dog in what you want her to do, she’ll happily oblige - removing the need for the master-slave approach and moving towards a friend-friend relationship. The lesson here? Follow your own instincts. There’s no need to listen to tv personalities who tell you otherwise. Don’t have anything to do with so-called trainers who want to hurt or intimidate your dog. Are we meant to be kind while we’re here? If we’re meant to put out kindness, perhaps we are meant to put it out universally, and not just to a select few. - and how to fix them fast! 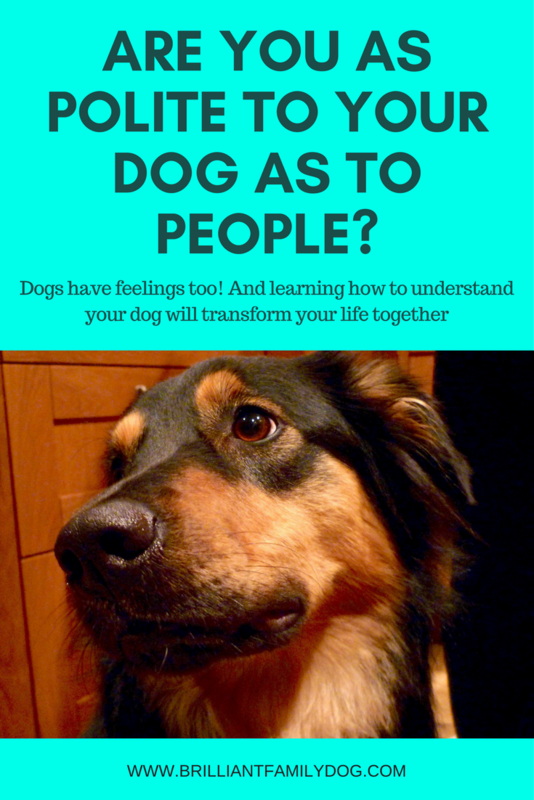 And here’s where you’ll find a free four-part email course to help you with your Growly Dog.